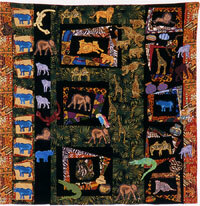 healyquilts.com > Works > It's a Jungle in Here! Now just a minute, exactly how many of you are there in this jungle? And may I ask what you’re all doing here? Mr. Rhino, you know you don’t live in a jungle, so please take your blue self back home: and by the way what are you doing being blue? Parrots, snakes, monkeys: okay you stay. But you other fellows have to go home to steppe and sand. And, don’t take the gourds with you. We plan to sell them in Dakar and Accra and other pretty sounding towns. Also leave the green leafs and the Kente windows; they’ll sell in LA or LAGOS. 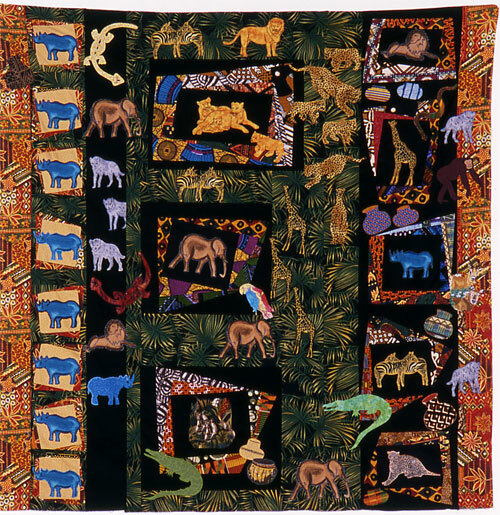 But thank you for revisiting Eden and proving that we can all live together lovingly in our jungle.